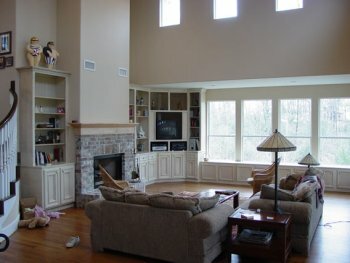 My wife and I built our dream home in 2006, moving into it New Years weekend, 2007. Our ideas were roughly sketched on an 8.5x11 sheet of graph paper when we first meet with our OBN representative. While our plans were being conceptualized by drafting and designers, the 14 evening "building classes" offered by OBN to members provided the foundation for the construction of a life long dream. Ideas, techniques, discussions of the pros and cons of building processes in the classes formulated the bases for our construction package. Face to face classroom presentation by actual building contractors with Q&A sessions gave us new insights in the formulation of our dreams. The latest in energy conservation techniques like Icynene insulation, whole house hot-water-on-demand, shaded overhangs over every low_e window, uses of CHF lighting incorporated into standard can lighting fixtures, high efficiency-two stage A/C plus many more ideas helped us realize an astonding $201 electric bill during the extremely hot month of June 2009 for a 5100 sq ft home with 2200 square foot living space. We maintain a 73° to 74° day time temperature and a 70° night time temperature in summer. The 5 and 7 foot high double pane windows totaling 275+ square feet of glass gives us the feeling of living outdoors among the trees and the forest wildlife while enjoying the comforts of the indoor living. Our home with its wrap-around porch, allows us to choose an outdoor shaded experience for sitting and enjoy a cool breeze at any hour of the day. With the assistance of financial services personnel indirectly associated with OBN, the arrangements for our construction financing made our building experience a smooth as glass. Except for shopping for building materials for construction, everything we needed for building was under the one single roof at OBN.